The media has been mixing up loan waiver and loan write off for the longest time. In fact, even Rahul Gandhi has peddled this lie multiple times even after being corrected. So when Nidhi Razdan, who is famous for conducting an entire debate based on fake news, furthered the same lie again, Twitter user and CS Ashutosh Muglikar felt compelled to explain the basics to her with a simple example. 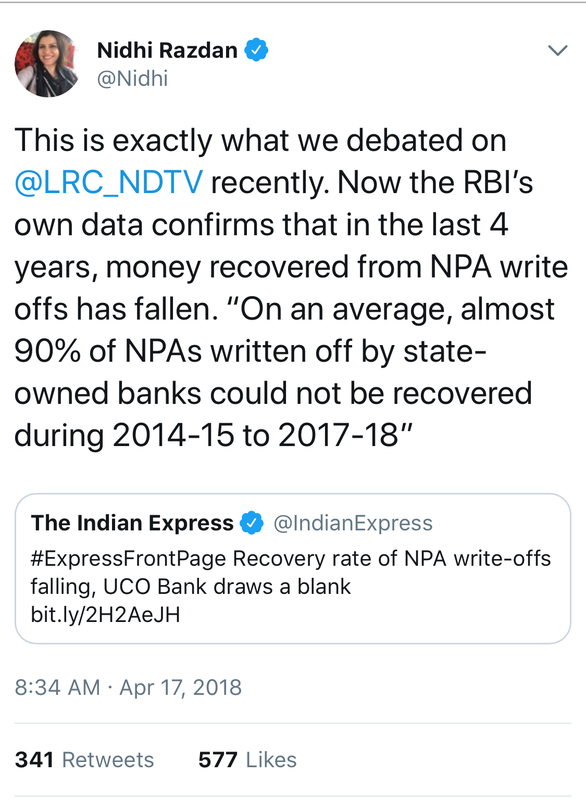 It all started with this tweet where Nidhi Razdan insinuated that if 90% money from Non Performing Assets haven’t been recovered, it means they might never be recovered. To this, Ashutosh Muglikar pointed out Nidhi’s flawed logic. He then proceeded to explain the concept with a simple example. He took the example of two friends, Ramesh and Suresh. He explains how Suresh borrows money from Ramesh at a 10% interest against security of his bike and scooter. They money was then invested in his business. Ramesh says ok fine I can lend u that amount at 10% interest per annum and against the security of ur bike and scooter. They have an agreement. Ramesh gives one lac rupees to suresh. Now suresh puts the money in his biz and all is well. He then explains a scenario where Suresh is unable to pay the amount. While Ramesh asks for the money back several times. Frustrated, Ramesh, in accordance with RBI rule, provides for the outstanding amount as a loss. Ramesh then ‘writes off’ the amount in his books and goes to the court to recover his money. After a while, he sells the scooter kept by Suresh as security and recovers Rs 10,000 from the Rs. 60,000 that he is owed. He postulates that while this entire process is on, a channel like NDTV starts screaming about how only 10,000 has been recovered and in their inimitable style, ask for the resignation of the Prime Minister. Meanwhile there are some retards at NDTV who in 2016 whine like idiots and say hey look Ramesh wrote off 60k but really recovered only 10k. Haha. And they demand resignation of a hardworking pm of their country. Ramesh is worried but ignores these ppl. Now comes 2018. He goes on to explain the court proceedings. Says that a man approached Ramesh with an offer to buy the entire company for Rs 40,000 and eventually, Ramesh decides to forgoe his ‘unapplied interest’ and recover whatever money he can. As time has passed Ramesh says no my principal dues and unapplied interest is now 90k. Then negotiations happen and Ramesh thinks ok its all messed so atleast I should be in a position to recover my principal, booked interest and maybe I shud forego my unapplied interest. Ramesh gets back principal plus applied interest. He loses on unapplied interest. Which was nothing but opportunity cost. He is now saying ok at least I recovered my main pie. I messed up earlier n I should be careful before lending to ppl like suresh. He then explains how NDTV and Nidhi Razdan’s logic is hollow and their shrill noise about how the money can never be recovered are nothing but uninformed opinions. He goes back and checks boss why did I lend to suresh in first place. He realizes that suresh and Ramesh children and friends and it was on insistence of Ramesh’s son that he had lent money to suresh. So loss kiski wajaah se hua? Due to conflict of interest n no brains. Loss is what haircut Ramesh had to take. Recovery is what the new dude could pay. Activity is called as Insolvency resolution. And ndtv morons remain impractical morons. Son’s behavior is the reason he nerds punishment. And 2019 voting shall be the event. Have a nice day. We can only hope that with such a simple illustration, we can only hope that people like Nidhi Razdan and Rahul Gandhi are able to grasp the nuances.